AFFECTED AREA: FIRE ZONE 511 EAST BAY HILLS AND DIABLO RANGE THIS INCLUDES THE HILLS ABOVE 1000 FEET IN ALAMEDA...CONTRA COSTA AND SANTA CLARA COUNTIES. TIMING: THE STRONGEST WINDS WILL DEVELOP SHORTLY AFTER SUNSET MONDAY NIGHT AND CONTINUE THROUGH TUESDAY MORNING. WARM AND DRY WEATHER WILL PERSIST THROUGH WEDNESDAY MORNING. WIND: NORTH TO NORTHEAST WINDS FROM 15 TO 30 MPH WITH GUSTS TO 40 MPH ABOVE 1500 FEET. THE STRONGEST WINDS ARE EXPECTED IN THE EAST BAY HILLS OF ALAMEDA AND CONTRA COSTA COUNTY WITH LIGHTER WINDS IN THE SANTA CLARA COUNTY HILLS. HUMIDITY: HUMIDITY VALUES WILL STAY BETWEEN 15 AND 30 PERCENT FROM MONDAY THROUGH WEDNESDAY. 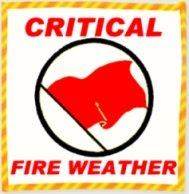 IMPACTS: THE COMBINATION OF A CRITICAL FIRE WEATHER PATTERN AND DRY FUELS COULD LEAD TO INCREASED FIRE ACTIVITY ACROSS THE REGION SHOULD ANY IGNITIONS OCCUR.